Experience a relaxing afternoon with Coastal Segway Adventures. 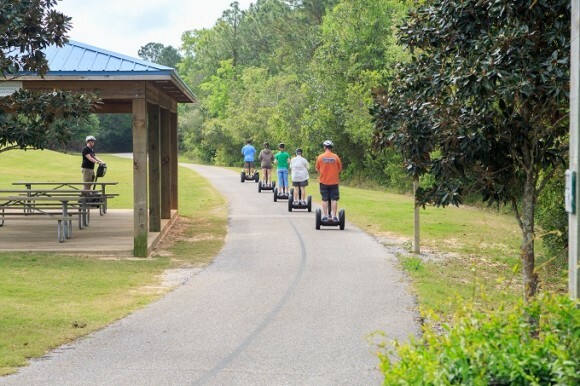 We offer a 2-hour guided Segway tour through the Hugh S. Branyon Backcountry Trail in Gulf State Park. Certified operators will begin each tour with a lesson on Segway operation. Experience beautiful forests, sparkling lakes and mysterious swamps and catch a glimpse of an amazing array of wildlife from alligators, bobcats, eagles, gopher tortoises, foxes and butterflies. • Reservations are required • Groups of more than 6 should call 48 hours in advance • No open-toed shoes allowed. Also offering guided kayak tours, guided paddle board tours and guided bike tours in the Gulf State Park.